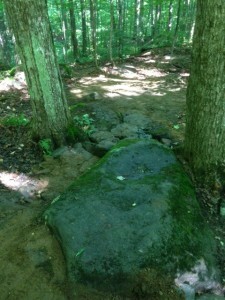 Hinesburg Town Forest – The Saga Finishes! I can remember it so vividly it was early fall 2003 the leaves were falling and we could see the unlimited expanse of the Hinesburg Forest western slopes. Steve Russell who at that time was the HTF committee solely had the foresight to see we were great stewards of the Forest and he allowed us to go ahead and install the trail system we have today. Though certain names pop up on who laid trails out and who installed them it was the trust and vision of Steve to allow the three of us to create the network. Steve is still part of the HTF committee but he has stepped down as president. His father planted the hundreds red pine trees in around where Nature Boy use to be, so Steve’s roots run deep in the forest. The area we were analyzing looked like a series of steps with plateaus in between maybe rising about 10-20 feet with each riser. Finally, the area flattened out towards the top to a rolling rambling peak that stretched over a few miles. It was an endless sight line with many terrain variations and open areas where trees were 20-30 feet apart. My partner, actually leader, founder of Fellowship, and visionary Hans Jenny and I were creating, flagging and talking over each other so much on where a new trail should go that neither was listening to each other. It was like two brothers on Christmas having to share the same toy that they both wanted for themselves. We started a new trend back at that time which was a corner stone for FOTW. We actually researched the area, walked it several times, looked at maps and contour lines, rough flagged it and then came back and made it more exact. 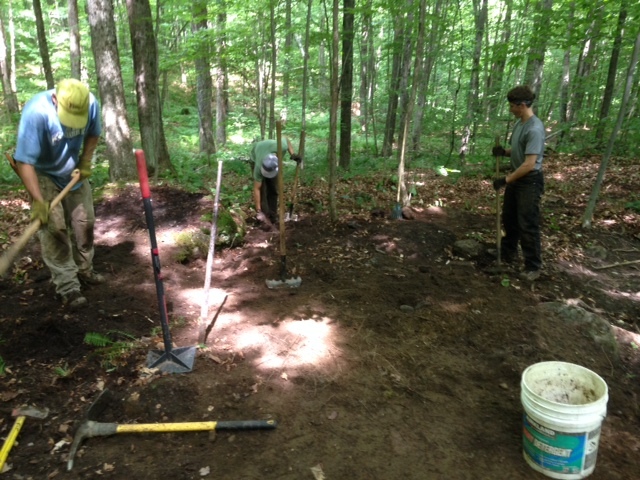 By this time in our careers we had participated in our first IMBA trail building course and were ready to put it to good use. At the same time we had a local UVM college graduate in geography with an avid mountain and biking background, Brooke Scatchard. Together the three of us laid out what are now Dragon’s Tail and the Back Door from Hayden Hill West along with the rest of the trails. The spaghetti type of switchbacks that are laid on top of each other create the climb to the top of the forest. This was Hans’ specialty and it allowed the rider to gain elevation, make a turn, and then have some rest on a long straight track towards the next switchback. Approaching the top of the mountain we decided to utilize a lot of the existing ledge rock for the trail. 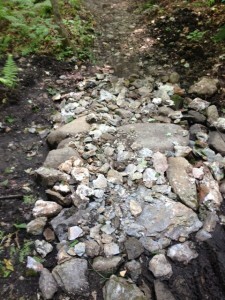 This is where Brooke’s Rocon (chain geared motorcycle with eight inch wheels) with a homemade trailer attached hauled buckets of gravel to reinforce the muddy areas between the ledge rock. I remember pushing the Rocon up the trail because we had loaded it with too much weight one day. Yes, we were indeed possessed back then. We also had volunteer days where we did not just rake but we actually had our first grub hoes put to work. This was probably the first type of trail that was benched, some roots removed, and most of the topsoil taken off to expose the subsoil layer. This subsoil layer creates a firm surface and allows you to shed water by outsloping and nicking out on the side of the trail. Brooke brought a more engineered and technical focus to our building. 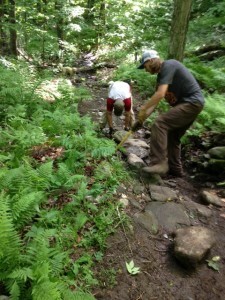 He was instrumental in getting FOTW to the next level with IMBA classes and new tools. Today Dragon’s tail is a bit different. A big winter storm blew down many trees on the top and we had to eventually close it and make the reroutes we have today. We eventually renamed parts of Dragon’s Tail to Back Door from Hayden West up to the top. The naming came by all three of us creating slogans ideas and catchy names but in the long run it was Hans who coined most of the trail names that stuck. The trail climbs the forest and then travels through the north south line on the ridge and then snakes back down, like a long Dragon’s Tail lying over the area. Through the years Dragon’s Tail has deteriorated mostly because of location to water holding areas, lack of proper water shedding and the blow down from years ago. Large trees covered the top to the point it was hard to cut them all away plus it has allowed a lot of underbrush to grow up now that there is more sunlight getting to the base. This season the FOTW Trail Crew took on these challenges with the remaining RTP grant we received. DT was rebenched, outsloped, water bars added, a few bridges were built, hundreds of feet of armoring added, pruned, and we used our new-but-old technique of creating corduroy. Once again, we only use this technique when we are to far away to haul material in or unable to find any near by. In 5 years we will need to replace those areas again. To enhance this long sinuous trail even more, the addition of features was added, taking advantage of existing rock, boulders and drops along the trail. At the start Dragon’s Tail was installed as a climbing trail to get to the top and then go to Wolf Tree, Passing the Horizon, etc. Now with the new work completed, rerouting and the addition of features the trail is as popular going from either Economou or Hayden West. We hope you enjoyed this series about the HTF and the RTP grant we received. You can see it is not any one person who does all the things it takes to put in a network. Instead it takes years to create, rotating personnel, good building technique, design and a community that will support and utilize it. 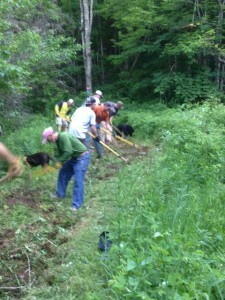 That is why it is so crucial to get two more folks who support the HTF and are a Hinesburg resident to join the HTF committee (see our recent Trail Crew Update). We hope you enjoyed this small series and some of the background and key passionate people who have been part of it. Thank-you for your support financially and philosophically. Representing FOTW Board of Directors, Trail Crew and members. Recent Trail Crew News and a Big Thanks to Josh Finkelstein! The crew took a long needed week off from the spring maintenance and the summer building season last week. Twelve uninterrupted weeks out on the trails in our seven networks maintaining, renovating, shedding water, building bridges/features, benching and out slopping the trails has a tendency to take a toll on your body. Fortunately, our timing was great because it was a wet week with several cold fronts moving through so we would have had to take some days off anyway. A big thank-you to Josh Finkelstein, CVU graduate from Charlotte who has worked with us since June. Josh did his senior community project with FOTW last season and liked it so much he wanted to work full time. This is Josh’s second season with us and he is headed to Northeastern College in Massachusetts next week. His course of study will be chemical engineering. Thanks Josh for a great hard working season and good luck in the big city. The TC moved from Saxon Hills to the south side of HTF to work on the grueling Back Door trail that links the HTF to Carse Hills. After a quick walk through with local Chris Hill (an avid biker and supporter of FOTW) we flagged and tagged the areas that needed renovation. 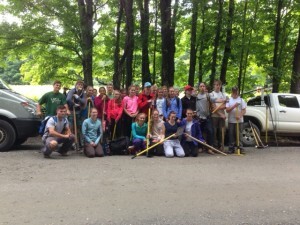 On Monday 8/18 the TC and 35 Green Mountain Valley School kids and teachers joined us for a volunteer workday. 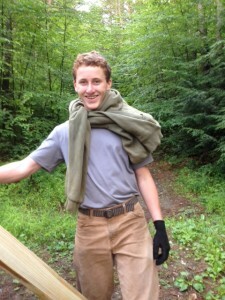 Sam Jackson of GMVS organized three groups of athletes to work in the Waitsfield Valley and over the mountain to work outside their community. This community outreach was part of their orientation before classes start on Tuesday. We split the athletes up in six groups and hiked them one and half miles up the trail and began derooting, benching, armoring and shedding water. They were fun, animated and a huge help. Thanks GMVS, see you on the slopes. With a great start on Back Door by the GMVS students, the TC decided to finish the week out there on the south side of HTF on Back Door. Several reroutes were put in and lots and lots of derooting. This trail gets a lot of use by our “epic riders” who like to go from Richmond or Sleepy Hollow through HTF to Carse and back the same way. This one and half mile trail can be grueling to climb especially if it is wet. The trail meanders through a deciduous hardwood forest with over 50% beech trees dominating the population. Beech trees have many surface roots that run like fingers on the ground and can be very slippery even when dry. 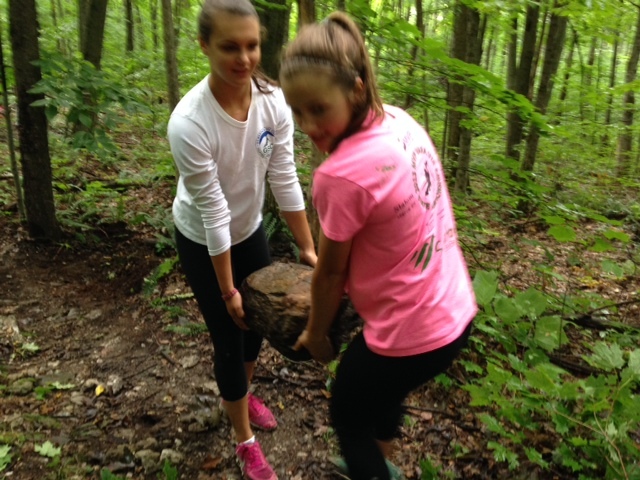 Our goal was to make it a less strenuous climb. So check it out on Friday of this week when we finish our first phase. With the weather cooling now is the time for the epic ride, but now you can climb Back Door instead of taking Main Road back. The TC will be back at Saxon next week to finish the roller coaster on Flo. 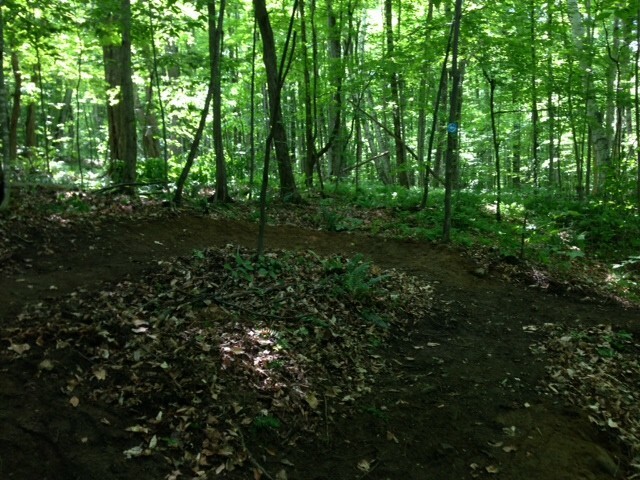 The Hinesburg Town Forest Committee has just completed some great work on the Economou Road / Eagle Trail to improve tread surface and drainage. 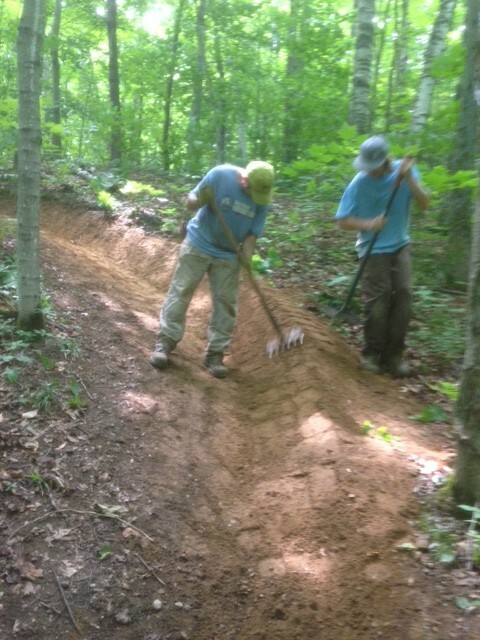 They ask that all users please WALK ONLY through the new work to avoid creating tire ruts while the trail stabilizes for the next month. The Hinesburg Town Forest Committee currently has two vacancies. 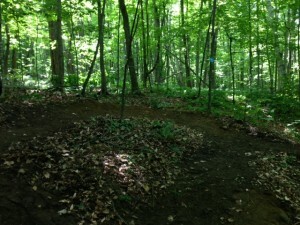 The Committee has final say over what goes in the Forest – and it has not always looked favorably on mountain biking, even now. Fellowship would love to expand our network in the HTF and this will not happen unless we get better support on the HTF Committee. You must be a Hinesburg resident and attend one meeting a month. Contact Chris Haviland at swishmystr@aol.com of the Hinesburg Town Office at hinesburgclerk@gmavt.net of call 802.482.2281 x1223 for info. 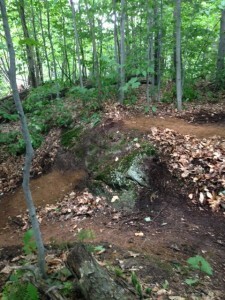 The History of the Hinesburg Town Forest Trails – Part Deux! After finishing Maiden at the end of May this year we tackled the ever-ignored International Trail. 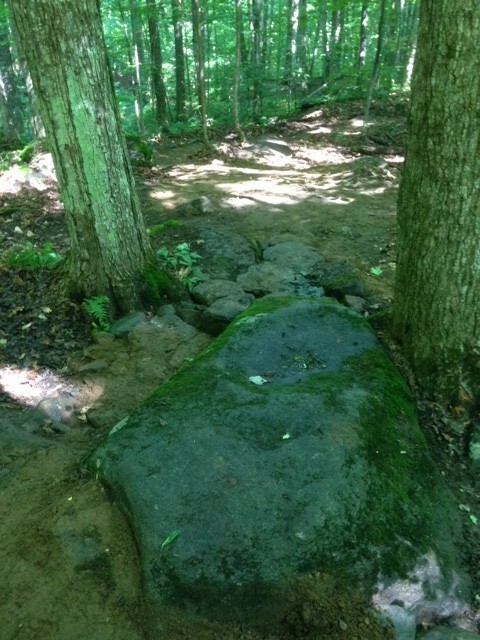 This is one of the oldest trails in the HTF and was probably started around 1995/96. The only other trails in there at that time were logging roads and the Eagle Trail. With our RTP grant we wanted to create a multi use, beginner to intermediate loop as a base for this network that has had some haphazard design. International received its name by local bikers who rode around an old rusted International pick up truck. Today’s location of the trail is different than when it was established but it is more connected to the rest of the HTF system now. The trail was installed as more of a climbing trail from east to west that followed up and down the contour lines of less than 75’ as it went past two small hills of about 1100’ just to the south and above the trail less than a 1000’. This area for years was popular with mud bogging and 4-wheelers. The forest has been logged extensively and this area housed a lot of the roads and log landings for staging lumber to be hauled away. The other challenges with this trail is it is a the bottom plateau of the two hills so it receives pressurized water from above through ledge rock and many natural primary seasonal streams that are intermittent through the year. Thus, lots of mud and flowing water going through during spring and when there is a hard rain. Probably the wettest trail in our whole system. International can resemble a stream sometimes. So needless to say we had our hands full with trying to solve this and create the best ways to make it rideable right after a storm. 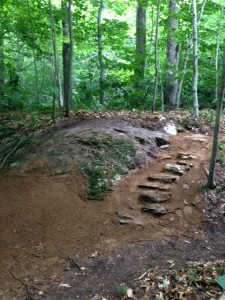 Our secondary goal was to make it enjoyable for walker and bikers because before it was a long straight trail. When you add that to the puzzle you have a fun problem-solving endeavor to play with. The 1.6 mile trail now has a: 125’, 30’, 40’, 25’,20’ and a 15’ bridge spanning wet areas throughout the year with a 32’’ tread for most. 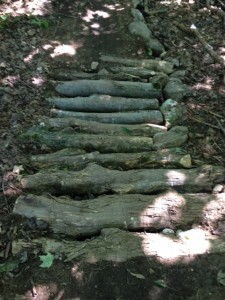 The use of the natural stone on the ground and on ledge rock that is able to break apart allows you to create these bomb proof “Roman Roads” I was discussing in the last part of this blog. We made a series of actual waterfalls on the trail that were gouged out over 2’ deep and had a length over 60’. 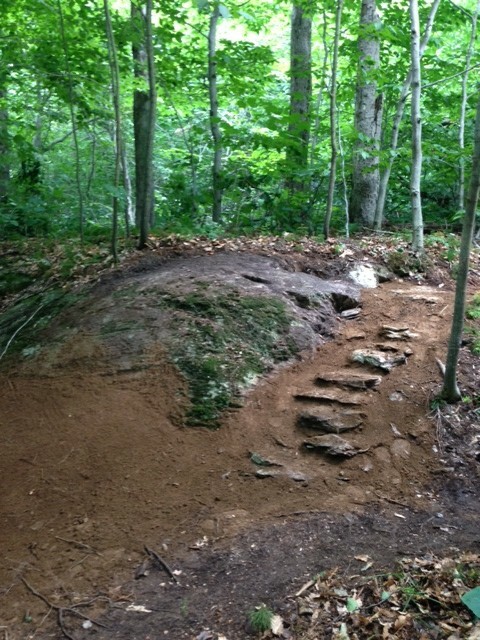 So we employed our landscape skills and built a rock armored step system that could be rode or walked either way. These were some of the most challenging due to the amount of material to collect, funneling water through it but at the same time not letting it erode or move all the material away. Plus make them fun or with a feature! One of our many bridges. Trail crew installed many feet of Roman Roads. Several reroutes with features were added throughout the trail to go around wet areas and to change the monotony of a straight line for over 400-1500’. One of the best ones is to the east end where it meets Passing the Horizon and Homestead. We had the chance to use some natural boulders that were 10x12x20’ and we linked several together with different rock faces to take. 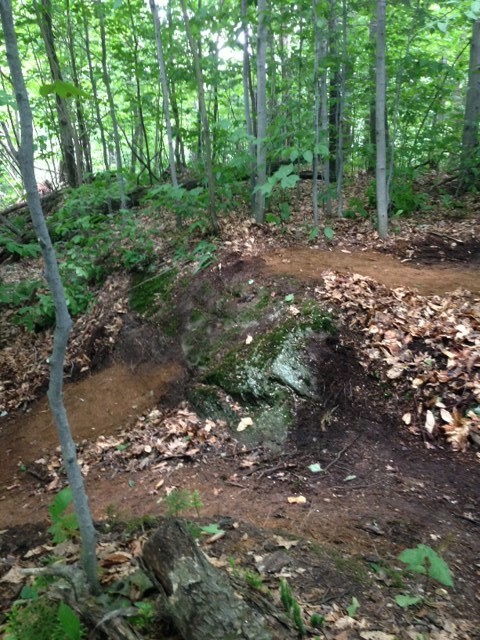 We even added in some downhill berm turns. Probably one the most ambitious and creative but yet functional projects was installing a new approach to International and Homestead through the old apple orchard and settlers cabin. We created a series of chicanes and switchback to climb from 700’-900’. Nice long rest areas in between short steep turning elevation changes with a few omega turns to get some speed. An omega turn is one that climbs in elevation, makes a directional change of over 180 degrees and puts in a little downhill glide after you make the elevation turn. They are unique and a blast to ride. 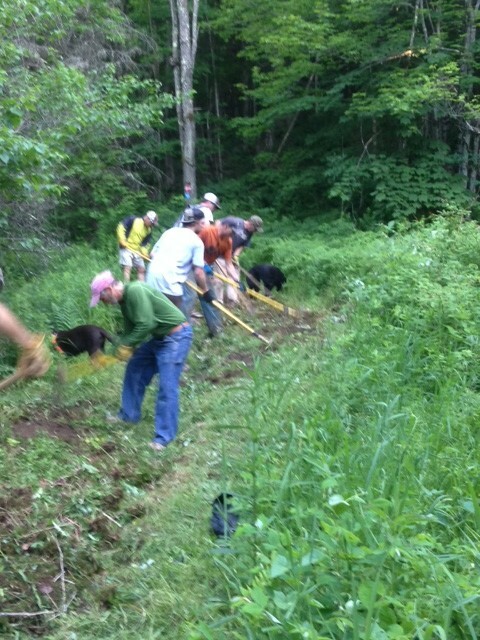 All in all, it was a pleasure with our crew, Ben and Jerry’s, Dealer.com and volunteers on trail nites renovating a trail that was almost a rushing creek. Maiden and International make an interesting, challenging, scenic, fun 3-mile loop to start your ride, make it your ride or to get to one of the upper trails. Remember these are multi use trails and you will see all levels on them so recreate appropriately and yield to the novice and slower mover. Nest issue part 3 Dragons’ Tail. 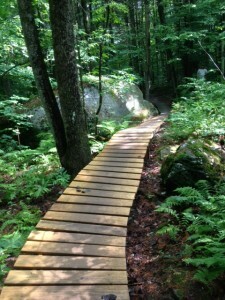 The Recreation Trails Program Grant is one major way that we fund our trails. Membership fees contribute a lot, too, but we’re always fundraising. 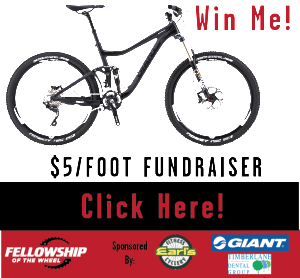 If you haven’t checked out $5 a Foot Fundraiser, where we raffling off any size Giant Trance Advanced (carbon! ), for just $5 a chance. Raffle ends August 15th – Sign up Now!